Bu araştırmanın amacı okul müdürlerinin liderlik davranışları ile öğretmenlerin örgütsel bağlılığı arasındaki ilişkilere yönelik yürütülmüş çalışmaların sistematik açıdan analizini yapmaktır. Bu amaçla Türkiye örnekleminde 2000-2017 yılları arasında WOS, ERIC, EBSCO, SCOPUS, ULAKBİM dizinleri ve veri tabanlarında taranan ve belirli kriterlere göre seçilen 23 makale çalışması değerlendirmeye alınmıştır. Sonuç olarak incelenen makalelerde, okul müdürlerinin daha yüksek düzeyde liderlik davranışları göstermeleriyle birlikte öğretmenlerin okullarına olan bağlılıklarının arttığı sonucuna ulaşılmıştır. Çalışmalarda öne çıkan liderlik davranışları okulda ortak amaç ve vizyona sahip olma, iş birliği kültürü oluşturma, iletişim ve etkileşimi artırma, bireylere ilgi gösterme ve değer verme, destekleyici ve geliştirici davranışlar, adaletli olma, saygı ve güven temelli çalışma kültürü oluşturma, sorumluluğu paylaşma, okulda değişimi yönetme ve sürdürme olarak tespit edilmiştir. Öte yandan incelenen çalışmalarda okul müdürlerinin örgütsel bağlılıklarıyla dönüşümcü liderlik, hizmetkâr liderlik ve etik liderlik davranışlarının pozitif yönde ilişkili olduğu bulunmuştur. Bununla birlikte bu liderlik davranışlarının örgütsel bağlılığın önemli yordayıcıları olduğu görülmüştür. The aim of this study is to conduct a systematic review of studies on the relationship between school principals' leadership behaviours and teachers' organisational commitment. For this purpose, 23 research articles indexed in WOS, ERIC, EBSCO, SCOPUS and ULAKBİM databases between 2000-2017 in the Turkish context and selected through certain criteria were collected for analysis. According to the results of the studies examined, as school principals performed a higher level of leadership behaviours, teachers' level of commitment to their schools increased. The leadership behaviours that were prominent in these studies were having a common objective and vision in school, forming a culture of cooperation, enhancing communication and interaction, showing interest and appreciation of individuals, supportive and constructive behaviours, being fair, creating a working culture based on respect and trust, sharing responsibilities, and managing and maintaining change in school. Moreover, in the studies, school principals' organisational commitment was reported to be positively related to transformational leadership, servant leadership and ethical leadership behaviours. These leadership behaviours were also found to be important predictors of organisational commitment. Allen, N. J., & Meyer, J. P. (1993). Organizational commitment: evidence of career stage effects?. Journal of Business Research, 26(1), 49-61. Anderman, E. M., Belzer, S. & Smith, J. (1991). Teacher commitment and job satisfaction: The role of school culture and principal leadership. ERIC. Accessed on 05/06/2018 from https://files.eric.ed.gov/fulltext/ED375497.pdf. Andrews, R. L., & Soder, R. (1987). Principal leadership and student achievement. Educational Leadership, 44(6), 9-11. Brown, M., Trevino L., & Harrison D. (2005). Ethical Leadership, a social learning perspective for construct development and testing. Organizational Behavior and Human Decision Processes, 97, 117-134. Buchanan, B. (1974). Building organizational commitment: The socialization of managers in work organizations. Administrative Science Quarterly, 533-546. Canrinus, E. T., Helms-Lorenz, M., Beijaard, D., Buitink, J., & Hofman, A. (2012). Self-efficacy, job satisfaction, motivation and commitment: Exploring the relationships between indicators of teachers’ professional identity. European Journal of Psychology of Education, 27(1), 115-132. Cheng, Y.C. (1990). An investigation of antecedents of organizational commitment. Educational Research Journal, 5, 29-42. Chew, J., & Chan, C. C. (2008). Human resource practices, organizational commitment and intention to stay. International Journal of Manpower, 29(6), 503-522. Choi, P. L., & Tang, S. Y. F. (2009). Teacher commitment trends: Cases of Hong Kong teachers from 1997 to 2007. Teaching and Teacher Education, 25(5), 767-777. Cowden, T., Cummings, G., & Profetto‐Mcgrath, J. (2011). Leadership practices and staff nurses’ intent to stay: a systematic review. Journal of Nursing Management, 19(4), 461-477. Cummings, G. G., MacGregor, T., Davey, M., Lee, H., Wong, C. A., Lo, E., ... & Stafford, E. (2010). Leadership styles and outcome patterns for the nursing workforce and work environment: a systematic review. International Journal of Nursing Studies, 47(3), 363-385. Day, C., & Leithwood, K. (Eds.) (2007). Starting with what we know. In Successful principal leadership in times of change: An international perspective. Springer: Science & Business Media. Davies, E. B., Morriss, R., & Glazebrook, C. (2014). Computer-delivered and web-based interventions to improve depression, anxiety, and psychological well-being of university students: a systematic review and meta-analysis. Journal of Medical Internet Research, 16(5), 18-39. EPPI-Centre (2006). EPPI-Centre methods for conducting systematic reviews. Accessed on 10/06/2018 from http://pblevaluation.pbworks.com/w/file/fetch/14976232/EPPI-Centre_Review_Methods_1.pdf. Geijsel, F., Sleegers, P., Leithwood, K., & Jantzi, D. (2003). Transformational leadership effects on teachers’ commitment and effort toward school reform. Journal of Educational Administration, 41(3), 228-256. Germain, B. P., & Cummings, G. G. (2010). The influence of nursing leadership on nurse performance: a systematic literature review. Journal of Nursing Management, 18(4), 425-439.Gough, D. (2007). Weight of evidence: a framework for the appraisal of the quality and relevance of evidence. Research Papers in Education, 22(2), 213-228. Hallinger, P., & Heck, R. H. (1996). Reassessing the principal’s role in school effectiveness: A review of the empirical research. Educational Administration Quarterly, 32(1), 27-31. Hallinger, P., Bickman, L., & Davis, K. (1996). School context, principal leadership, and student reading achievement. The Elementary School Journal, 96(5), 527-549. Harris, A. (2004). Distributed leadership and school improvement: leading or misleading?. Educational Management Administration & Leadership, 32(1), 11-24. Hart, D. R., & Willower, D. J. (1994). Principals' organizational commitment and school environmental robustness. The Journal of Educational Research, 87(3), 174-179. Heck, R. H., Larsen, T. J., & Marcoulides, G. A. (1990). Instructional leadership and school achievement: Validation of a causal model. Educational Administration Quarterly, 26(2), 94-125. Heck, R. H., & Hallinger, P. (2009). Assessing the contribution of distributed leadership to school improvement and growth in math achievement. American Educational Research Journal, 46(3), 659-689. Higgins, J. P., & Green, S. (Eds.). (2011). Cochrane handbook for systematic reviews of interventions . John Wiley & Sons. Jackson, T. A., Meyer, J. P., & Wang, X. H. (2013). Leadership, commitment, and culture: A meta-analysis. Journal of Leadership & Organizational Studies, 20(1), 84-106. Karaçam, Z. (2014). Sistematik derleme metodolojisi: Sistematik derleme hazırlamak için bir rehber. Dokuz Eylül Üniversitesi Hemşirelik Fakültesi Elektronik Dergisi, 6(1), 26-33. Leithwood, K., & Jantzi, D. (2000). The effects of transformational leadership on organizational conditions and student engagement with school. Journal of Educational Administration, 38(2), 112-129. Leithwood, K. A., & Riehl, C. (2003). What we know about successful school leadership. Philadelphia: Laboratuary Student Succes, Temple University. Accessed on 10/06/2018 from http://olms.cte.jhu.edu/olms2/data/ck/file/What_we_know_about_SchoolLeadership.pdf. Leithwood, K., & Jantzi, D. (2005). A review of transformational school leadership research 1996–2005. Leadership and Policy in Schools, 4(3), 177-199. Lunny, C., Brennan, S. E., McDonald, S., & McKenzie, J. E. (2016). Evidence map of studies evaluating methods for conducting, interpreting and reporting overviews of systematic reviews of interventions: rationale and design. Systematic Reviews, 5(1), 1-8. Mathieu, J. E., & Zajac, D. M. (1990). A review and meta-analysis of the antecedents, correlates, and consequences of organizational commitment. Psychological Bulletin, 108(2), 171-194. Mathieu, J. E., & Farr, J. L. (1991). Further evidence for the discriminant validity of measures of organizational commitment, job involvement, and job satisfaction. Journal of Applied Psychology, 76(1), 127. Meyer, J. P., & Allen, N. J. (1991). A three-component conceptualization of organizational commitment. Human Resource Management Review, 1(1),61-89. Morris, J.H., & Sherman, J.D. (1981). Generalizability of an organizational commitment model. Academy of Management Journal, 24, 512-526. Murphy, J., & Vriesenga, M. (2006). Research on school leadership preparation in the United States: An analysis. School Leadership and Management, 26(2), 183-195. Nguni, S., Sleegers, P., & Denessen, E. (2006). Transformational and transactional leadership effects on teachers' job satisfaction, organizational commitment, and organizational citizenship behavior in primary schools: The Tanzanian case. School Effectiveness and Sschool İmprovement, 17(2), 145-177. O'Reilly, C. A., & Chatman, J. (1986). Organizational commitment and psychological attachment: The effects of compliance, identification, and internalization on prosocial behavior. Journal of Applied Psychology, 71(3), 492-503. Reichers, A. E. (1985). A review and reconceptualization of organizational commitment. Academy of Management Review, 10(3), 465-476. Ross, J. A., & Gray, P. (2006). Transformational leadership and teacher commitment to organizational values: The mediating effects of collective teacher efficacy. School Effectiveness and School İmprovement, 17(2), 179-199. Silins, H. C. (1994). The relationship between transformational and transactional leadership and school improvement outcomes. School Effectiveness and School Improvement, 5(3), 272-298. Spillane, J. P. (2003). Educational leadership. Educational Evaluation and Policy Analysis, 25(4), 343-346. Victor, L. (2008). Systematic reviewing. Social Research Update, 54(1), 1-4. Waters, J. T., & Marzano, R. J. (2006). School district leadership that works: The effect of superintendent leadership on student achievement. ERS Spectrum, (25)2, 1-2. Youngs, P., & King, M. B. (2002). Principal leadership for professional development to build school capacity. Educational Administration Quarterly, 38(5), 643-670. Yukl, G. (2012). Effective leadership behavior: What we know and what questions need more attention. The Academy of Management Perspectives, 26(4), 66-85. Akan, D. (2015). Okul yöneticilerinin liderlik stilleri ile öğretmenlerin örgütsel bağlılıkları arasındaki ilişkinin incelenmesi [Examining the relationship between school administrators’ leadership styles and teachers’ organisational commitment]. Eğitim Journal of Education and Humanities: Theory and Practice, 6(11), 123-150. Arabacı, İ. B. (2014). Okul müdürlerinin karizmatik liderlik özellikleri ile öğretmenlerin örgütsel bağlılıkları arasındaki ilişki [The relationship between school principals’ charismatic leadership skills and teachers’ organisational commitment]. Turkish Journal of Educational Studies, 1(1), 192-221. Ayık, A., Yücel, E., & Savaş, M. (2014). Öğretmenlerin örgütsel bağlılıklarının yordayıcısı olarak okul yöneticilerinin etik liderlik davranışları [School administrators’ ethical leadership behaviours as predictors of teachers’ organisational commitment]. Dumlupınar University Journal of Social Sciences, (42), 27-36. Aytaç, T. (2015). The relationship between teachers’ perception about school managers' talent management leadership and the level of organizational commitment. Eurasian Journal of Educational Research, 59, 165-179. Bektaş, F., Çoğaltay, N., & Sökmen, Y. (2014). Öğretmen algılarına göre okul müdürlerinin liderlik stillerinin örgütsel bağlılık üzerindeki rolü [The role of school principals’ leadership styles on organisational commitment based on teacher perceptions]. International Journal of Turkish Education Sciences, 2014(3), 122-130. Bozkuş, K., & Gündüz, Y. (2016). Ruhsal liderlik ile örgütsel bağlılık arasındaki ilişkinin modellenmesi [Modelling the relationship between spiritual leadership and organisational commitment]. Kastamonu Education Journal, 24(1), 405-420. Buluç, B. (2009). Sınıf öğretmenlerinin algılarına göre okul müdürlerinin liderlik stilleri ile örgütsel bağlılık arasındaki ilişki [The relationship between school principals’ leadership styles and organisational commitment based on elementary school teachers’ perceptions]. Educational Administration: Theory and Practice, 57(57), 5-34. Cerit, Y. (2010). The effects of servant leadership on teachers’ organizational commitment in primary schools in Turkey. International Journal of Leadership in Education, 13(3), 301-317. Çağrıcı, D. Ç., & Savaş, A. C. (2016). İlkokul ve ortaokul müdürlerinin değişim liderliği davranışları ile öğretmenlerin örgütsel bağlılıkları arasındaki ilişki [The relationship between elementary and middle school principals’ leadership behaviours and teachers’ organisational commitment]. Journal of Human Sciences, 13(1), 621-631.Çetin, Ö., & Aydın, B. (2012). Ortaöğretim okulu yöneticilerinin dönüşümsel liderlik özelliklerinin öğretmenlerin örgütsel bağlılıklarına etkisi [The effect of high school administrators’ transformational leadership behaviours on teachers’ organisational commitment]. Mustafa Kemal University Journal of Social Sciences, 9(19), 331-342. Çokluk, Ö., & Yılmaz, K. (2010). The relationship between leadership behavior and organizational commitment in Turkish primary schools. Bilig, 54, 75-92. Doğan, Ü., & Aslan, H. (2016). Özel eğitim kurumlarında çalışan müdürlerin hizmetkâr liderlik davranışları ile öğretmenlerin örgütsel adanmışlık düzeyleri arasındaki ilişki [The relationship between servant leadership behaviours of principals working in special education centres and teachers’ organisational commitment]. Ondokuz Mayıs University Journal of Education, 35(2), 51-68. Erdoğan, Ş., & Kolamaz, C. (2011). Destekleyici ve geliştirici liderlik özellikleri ile örgütsel bağlılık arasındaki ilişki [The relationship between supportive and developing leadership characteristics and organisational commitment]. The Journal of Turkish Educational Sciences, 9(2), 313-342. Kul, M., & Güçlü, M. (2010). Okul yöneticilerinin liderlik stilleri ile beden eğitimi öğretmenlerinin örgütsel bağlılıkları arasındaki ilişki [The relationship between school principals’ leadership styles and physical education teachers’ organisational commitment]. International Journal of Human Sciences, 7(2), 1021-1038. Madenoğlu, C., Uysal, Ş., Sarıer, Y., & Banoğlu, K. (2014). Okul müdürlerinin etik liderlik davranışları ile öğretmenlerin iş doyumlarının örgütsel bağlılıkla ilişkisi [The relationship of school principals’ ethical leadership behaviours and teachers’ job satisfaction with organisational commitment]. Educational Administration: Theory and Practice, 20(1), 47-69. Okçu, V. (2014). Ortaöğretim okulu yöneticilerinin etik liderlik davranışları ile öğretmenlerin örgütsel bağlılıkları arasındaki ilişki [The relationship between high school administrators’ ethical leadership behaviours and teachers’ organisational commitment Educational Administration: Theory and Practice, 20(4), 501-524. Teyfur, M. (2015). Ortaokul yöneticilerinin kültürel liderlik rollerini gerçekleştirme düzeyleri ile öğretmenlerin örgütsel bağlılığı arasındaki ilişki (Erzurum il örneği) [The relationship between high school administrators’ levels of achieving cultural leadership roles and teachers organisational commitment (Case of Erzurum province)]. Journal of Human Sciences, 12(2), 1002-1025. Uğurlu, C. T., Sincar, M., & Çınar, K. (2013). Ortaöğretim okulu öğretmenlerinin örgütsel bağlılık düzeylerine yöneticilerinin etik liderlik davranışlarının etkisi [The effect of administrators’ ethical leadership behaviours on high school teachers’ organisational commitment]. 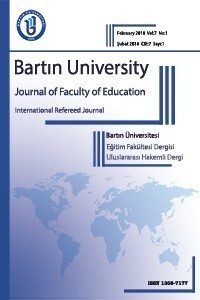 Erzincan University Journal of Education, 15(1), 266-281.Uğurlu, C. T., & Üstüner, M. (2011). Öğretmenlerin örgütsel bağlılık düzeylerine yöneticilerinin etik liderlik ve örgütsel adalet davranışlarının etkisi [The effect of administrators’ ethical leadership and organisational justice behaviours on teachers’ organisational commitment]. Hacettepe University Journal of Educationi, 41, 434-448. Uslu, B., & Beycioğlu, K. (2013). İlköğretim okulu öğretmenlerinin örgütsel bağlılıkları ile müdürlerin paylaşılan liderlik rolleri arasındaki ilişki [The relationship between elementary school teachers’ organisational commitment and principals’ shared leadership roles]. Ondokuz Mayıs University Journal of Education, 32(2), 323-345. Uygur, M., & Yıldırım, A. (2011). İlköğretim okulu yöneticilerinin kültürel liderlik rolleri ile öğretmenlerin örgütsel bağlılığı arasındaki ilişki [The relationship between elementary school administrators’ cultural leadership roles and teachers’ organisational commitment]. The Journal of The Industrial Arts Education Faculty of Gazi University, 27, 72-81. Yaman, E., & Ezer, Ö. (2015). Öğretmen algılarına göre ortaokul müdürlerinin öğretimsel liderlik davranışları ile öğretmenlerin örgütsel bağlılıkları arasındaki ilişki [The relationship between middle school principals’ instructional leadership behaviours and teachers’ organisational commitment based on teacher perceptions]. Journal of Bayburt Education Faculty, 10(1), 39-54. Yetim, Z. (2016). İlköğretim kurumlarında dağıtımcı liderlik ile örgütsel bağlılık arasındaki ilişki (Seydikemer örneği) [The relationship between distributive leadership and organisational commitment in elementary schools (Case of Seydikemer district]. Journal of International Social Research, 9(43), 1565-1572.